What Does Bravery Look Like? 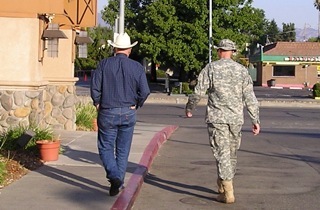 Bravery reminds me of the day I watched my husband and my son-in-law walk ahead of my daughter and me towards the restaurant for an early morning breakfast. I still remember the feeling I had knowing this would be our last breakfast together for a while. Our brave soldier would be leaving for a 15-month deployment. My heart filled with respect and admiration as I looked at this fine young man, and wondered what would cause a person to volunteer so freely to serve his country and willingly go into harm’s way for others. To stand and fight for people he does not know so they can enjoy safety and freedom too. Is it the brave determination of character to serve God and to do what is right because he loves his country and family? 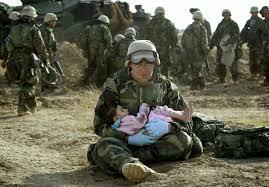 They say “Freedom is never free,” but there is always a price… physically, mentally and emotionally. In our country, there are various opinions on how our government and military should run. Or how we should help in other countries far away and remote from our lives. Have we forgotten what Bravery is, or what life would be like for us if this war were fought here in America or Canada? Every Country, even our own has paid an enormous price for freedom, and our friends far away are learning what the cost is with their suffering. But once they have tasted it, they will not stop until they have it for themselves, their families, and country. 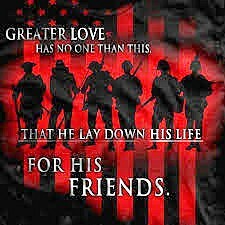 Thank You to all who serve, I am praying for you! Thank you for sharing your time with me, dear friend. What does the word Bravery bring to your mind? Previous Post: My Old Memories ~ I fell and can’t get up! Bravery! To me means standing firm in what I believe, to continue to do what is right even when it’s not the norm anymore. To be faithful and loyal even when my heart is hurting and keep trusting that God knows how it’s going to turn out. To keep my eyes on Him, the author and finisher of my faith.